Embossed, flowing filigree touched with gold brings Rapunzel's, as well as Tangled Disney movie, dynamic and artistic style to this wedding invitation. Embossed "lanterns" at the bottom symbolize floating lanterns. The tea length, gold shimmer card is printed with your wording in your choice of ink color and up to two lettering styles. Ecru inner and outer envelopes are included. Purple rhinestone accents sold separately. Size: 4" x 9 1/4"
We ordered the Rapunzel invitations for my daughter's wedding. Was very pleased how quickly they arrived. The paper quality and look has the elegant look we were looking for. Loved the hint of Disney on the back of the invitation with Cinderella's carriage. Such a perfect subtle touch. If I could change one thing I would have preferred the size of the font could have been a little larger. 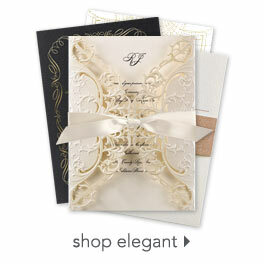 I absolutely love the subtlety of these invitations. I know they're from the Disney Princess line, they hint at the very aspect of the movie I want to capture but unless you look at the back of the invite it just looks pretty! I had no problem ordering them or putting them together. These invites are amazing!! We are even thinking about using the note cards as thank you cards.